It would otherwise have been an uneventful trip – students and families riding the rails back to Winnipeg in the mild, last days of summer, after enjoying the Labour Day weekend out at the lake. 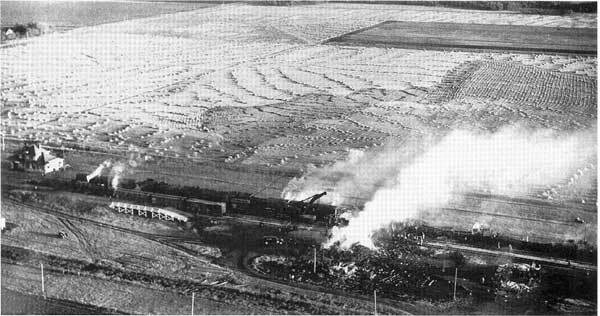 However, 1 September 1947, was the date of one of the most devastating train wrecks in Canadian history. At 9:44 p.m., just 10 kilometers east of Transcona, the westbound Minaki Campers’ Special hit a standing train head on, claiming 31 lives. Fire spread at a frightening rate, as the old wooden coaches of the Minaki Special were lit by gas lamps. Only seven of the victims could be identified and the remaining 24 were buried in a mass grave at the Brookside Cemetery, Winnipeg. Following are excerpts from a booklet created recently by the Springfield Women’s Institute, entitled Dugald Train Disaster, Memories from 1947. It contains firsthand accounts of survivors, victims’ family members, and those who assisted at the scene, including many from Dugald and Transcona. I remember a stranger who sat quietly in his car at the edge of the field and took in the scene; he had ‘felt drawn to come’ and had driven all the way from Texas. The site was still smoldering when he arrived. An engineer, he had been in a train wreck but said this was the worst he had ever seen. School started on Tuesday, the day after the accident. After school, I went to the accident site to help out. It was expected that anyone who could work, would. I remember shoveling grain – it was burnt and smelling of fuel. We used one of our trucks to haul it away; I wondered why they were removing the grain. My clean-up efforts were put to a stop when my Dad told me to leave; I had uncovered a leg. I remember my mother, Jenny, laying her fur coat on an injured couple who had been moved from the wreck on car doors. It was later learned that they were husband and wife. They were taken into Winnipeg in the back of a loaded grain truck. I believe they both died. My mother’s coat never came back. I went to work the very next day. I remember being nervous taking shorthand from my boss. I told him I was fine but he kindly made sure a doctor examined me. Several days later, an official looking man carrying a briefcase came into the office and questioned me. “What would you consider a settlement, would $25 be satisfactory?” he asked. “Oh, yes,” I agreed and signed a release. My boss was quite upset that I had done such a thing. The car behind us was engulfed in flames so we wasted no time sliding through the windows and onto the ground, where our father (Wilfred Perron, Sr.) brought us to safety in a farmer’s field. (He) went back to se if he could help someone. He then spotted a fellow that was in our car who was jammed in between the cars and couldn’t get his legs free. He proceeded to cut his legs but the man had lost too much blood and died. Dad, visibly upset, returned to gather us up and go towards the Dugald Station. (Uncle Wilfred) ran back to help others. There was a lot of screaming, fire and smoke. He tried to rescue a man unsuccessfully. (He) was very affected by the event and never talked about it again. It is remarkable how ordinary people of a tiny village, along with area farmers, could respond to such an incredible situation and apply talents few people knew they had. Everyone tackled the task at hand swiftly and proficiently. There were many unsung heroes that night. River East Transcona School Division newsletter, The Torch, Spring 2007, submitted by Cheryl Moore (cmoore2@retsd.mb.ca).